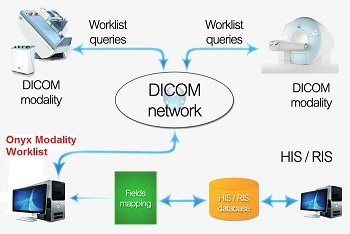 Can query any RIS or PACS that conforms to the DICOM Modality Work List standard. The entire modality work list can be queried for more specific searches that can be initiated based on patient name, patient ID, accession number, birth date, modality, and study date. By querying the DMWL,it allows hospitals to automatically populate the study with patient demographics and other DICOM information. With this,transcription errors are eliminated and procedures are performed more efficiently. Shows the entire DMWL query in a sizable window on the computer screen allowing the radiologic technologist to easily sort the work list by patient name (and other parameters) and quickly choose the patient of interest. Other solutions only show a few lines of information on a grayscale keypad that must be scrolled through and manipulated to find the proper information. Provides communication between any hospital information system (HIS) and Dicom modalities (HL7 to Dicom ),so all radiology exam requests and performance tracking on radiology machines (CT scan, MRI,...) will be made electronically .